I recently followed a restaurant on Twitter who then quickly replied with a Direct Message containing a link to get 50% off a meal there (I've blanked out the name). This use of social media is even more impressive considering it is a single restaurant rather than a chain but seems to be an organisation that understands the benefit of striking while the iron is hot to have an interaction with a potential customer. Where the first 4 columns are completed when the person calls to book and the last two when they ask for the bill. This back end analysis is the difference between just saying 'Loads of people used the vouchers' and knowing how the typical voucher user compares to a typical normal customer. If for example you are getting a disproportionate number of people coming in and spending little or nothing on drinks then that makes a huge difference to the profitability of the promotion. 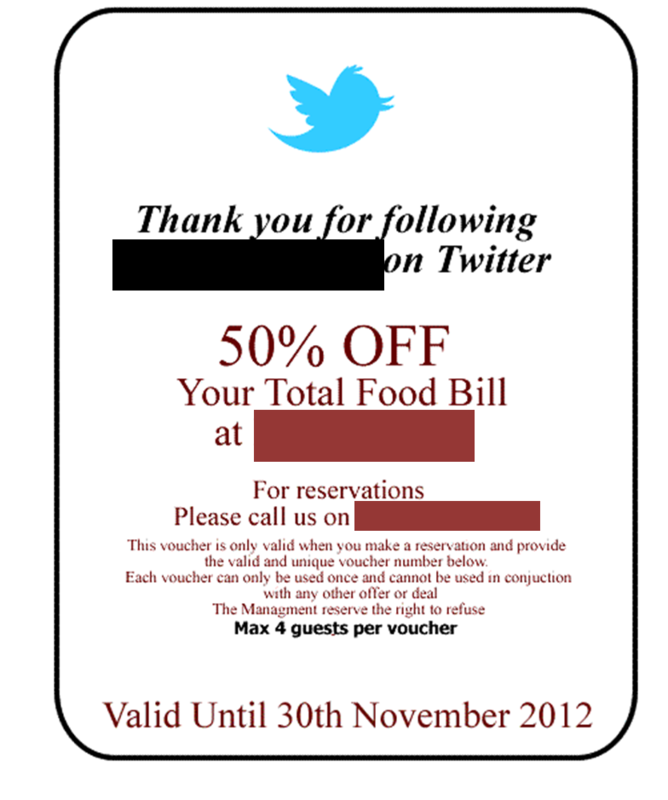 Obviously not every company can offer 50% off for everyone who follows them on Twitter but there is something to be said for making some kind of contact to people who follow you. Depending on the volume of followers this can either be an automated response or have a more tailored personal touch to show you've thought about what part of your offering you think the follower might be interested in.